Dry your hands just like you do it at home – using a real, cloth towel. A lot of businesses in New Zealand enjoy the advantages of this type of hand drying system. It doesn’t come much better than a pleasant, fast-absorbing towel after a nice hand washing. 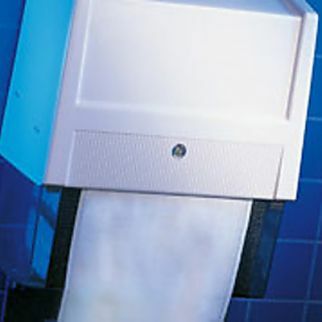 Cloth Towel Dispenser is Alsco’s original invention. It was created as a response to the issues noticed after decades in the washroom hygiene business. People enjoy wiping their hands with cloth towels – so we offered a cloth towel dispenser. Don’t worry, you will not get in contact with already used, dump towel. The Cloth Towel Dispenser has two chambers that are completely separated one from another. One contains the fresh and clean towel and the other one is where the used towel parts go. As a part of Alsco’s managed rental service, we come and replace your cloth towels when they are entirely unusable. We wash them on 150°C to be 100% sure they are completely sterilised and ready to use again.